Now that the Pixel 2 and Pixel 2 XL are available in Verizon stores (and the pre-orders have started shipping), it's time to take a good long look at what's inside these devices. Literally. 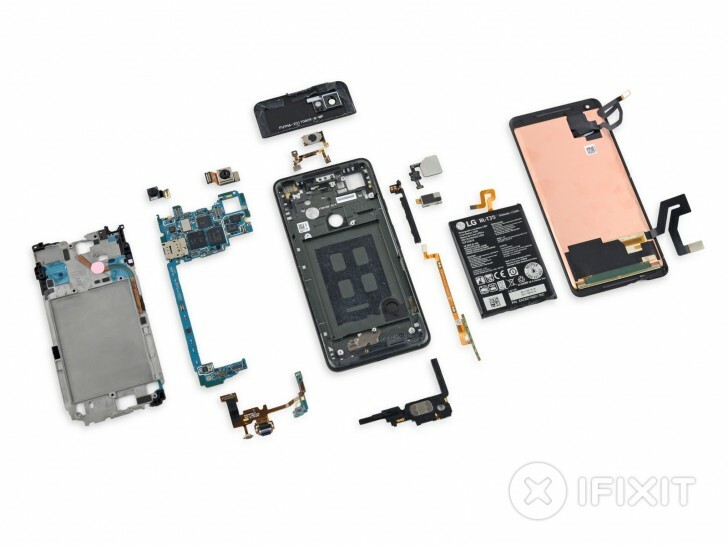 The enterprising folks over at iFixit have chosen to tear down the Pixel 2 XL today, revealing all of its innards. That includes the recently announced Pixel Visual Core custom chipset created by Google itself. This will be enabled in Android 8.1 for even faster computational photography abilities. As usual in a modern smartphone, the rest of the components come from a lot of different companies. There's Qualcomm's Snapdragon 835 chipset (actually manufactured by Samsung, by the way), an LG-made and LG-branded 3,520 mAh battery, Samsung RAM and flash storage, an NXP NFC module, and of course the embedded eSIM. The squeeze sensors (one of which you can see below) consist of a flexible PCB "wrapped around both sides of a line of steel chunks, with strain gauges bridging the gaps between the metal bits". Strain gauges are deformation-sensitive resistors. They slightly change their resistance when when stretched or squished, and that's how the software knows to interpret your squeezy actions. The USB-C port is on its own board, which is good because it's a high-wear item that may need to be replaced. That's made easy by this type of construction. In the end, the Pixel 2 XL receives a 6 out of 10 repairability score (where 10 is easiest to repair). Many of its components are modular and can be replaced once the display assembly is removed. There are only nine screws and all of them are a common type. On the other hand, the display is thin and the battery is pretty hard to remove. Finally, the "stubborn midframe and tight-fitting display cable covers" mean you'll have your work cut out for you if you do ever intend to repair the handset on your own. Hi, either the designer who makes this bad and the standby model needs to be imprisoned.